The world is full of clichés when it comes to measuring things: Bigger is better. The more the merrier. Size matters (we won’t even start to pick that one apart!). 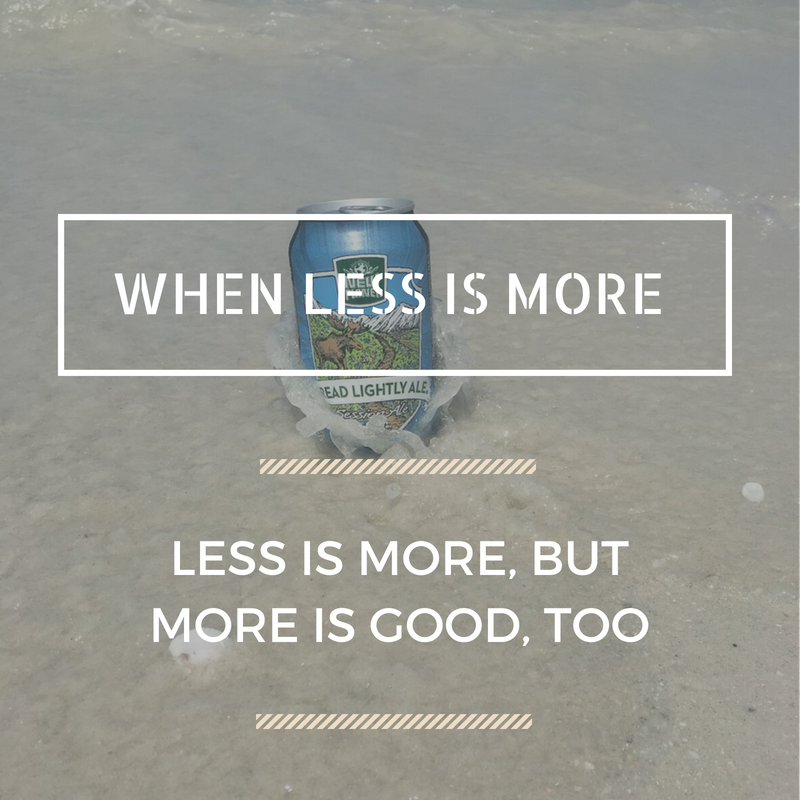 At New Planet Beer, we think there is a lot to be said for the cliché “less is more.” Not that there’s anything wrong with “the more the merrier”…in fact, we love great company and believe life’s moments are best shared with loved ones and friends. In terms of beer, though—especially the beers we brew—we think the Less is More cliché rings true for a lot of reasons. By now, chances are pretty good that you’ve encountered (or at least heard of) a “session beer.” Depending who you ask, what defines a session beer varies, but a session beer is generally considered to be any beer that clocks in at less than 5% ABV. Why is it called a session beer? Quick history lesson. During the First World War, factory workers in Britain making shells and and other equipment to arm the military were given two “sessions” during their shifts where they could drink during work (yep, you read that correctly!). Not wanting to lose a finger or limb in the factory after one of these sessions, though, the factory workers opted for lower ABV pints. And the “session” was born. All of the beers at New Planet contain less than 5% ABV, with the exception of our Pale Ale, which registers an ABV of 5.3%. When our customers tell us that they love the flavor of our beers and that they can enjoy one after a hike or a ride without feeling too tipsy, it makes us happy. Since 2009, we’ve been brewing gluten-free and gluten-reduced beer. If you’re Celiac or gluten intolerant (or just find yourself feeling better when gluten is a small fraction of your diet), then you know that less gluten—or none at all—is best for you. So not only are our beers low in ABV, but they’re either 100% gluten-free or crafted to remove gluten. Additionally, we think our beers are “lifestyle” beers not only because they’re gluten-free and gluten-reduced, but because we want you to be able to enjoy a New Planet Beer wherever your adventures take you. Since we can all of our beers, it’s easier than ever to toss a few in your daypack or kayak and reward yourself after another adventure. New Planet cans are also just as happy in a cooler by the campfire surrounded by good stories and great friends. When it comes to buying beer, we know you have options. Lots of options. Many of our friends in the brewing industry are coming up with imaginative, ground-breaking beers that whet the whistle of their customers and visitors. And we’re glad they’re doing it! But, we think less is more. By spending our time working on our core beers, we can focus on the quality and flavor of every beer with exacting detail. We know that consistency is king, which is why we test every batch coming out of our Denver brewery. We also make sure we’re sourcing the best ingredients for your gluten-free and gluten-reduced beers. At the end of the day, we want you to enjoy beer that you love. We want our beers to be something that you can enjoy all day long and still pursue the things you enjoy doing. Sure, clichés may be tacky, but sometimes they perfectly sum up the moment, right? Well, I guess that’s all she wrote! Until next time.